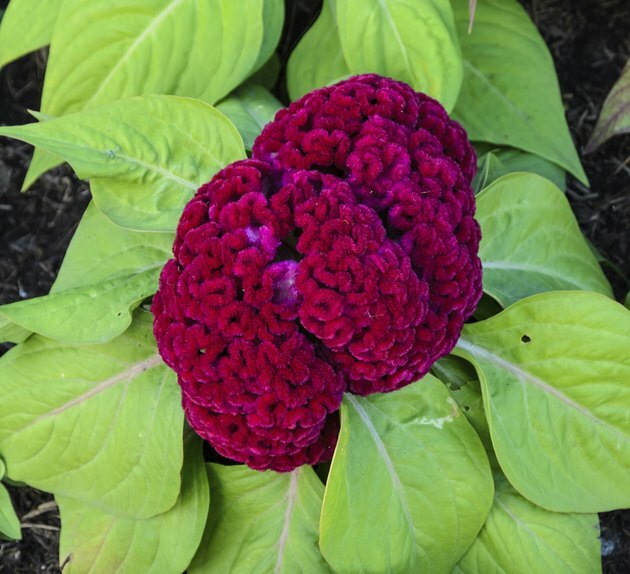 Some cockscomb flowers (Celosia argentea var. cristata) are feathery plumes, some are spikes and some look like wrinkled brains or tangled yarn, but all thrive in well-drained, moist soil in full sun. The four cockscomb groups are Plumosa, Spicata, Cristata and Childsii. Cockscombs usually grow as annual plants, but in U.S. Department of Agriculture plant hardiness zones 10 through 12 they're short-lived perennials. Garden centers and nurseries sell cockscombs in plant cell packs in spring. Cockscombs flower mid-summer through early fall. Cockscomb flowers need to adjust outdoor conditions, or harden off, before they're planted in the garden. If you bought your cockscombs from a supplier or grew them yourself from seed indoors, your plants will be too tender to transplant right away. Leaving them outdoors for increasing amounts of time toughens the leaves and stems and reduces transplantation stress. After the final frost date has passed, place the cockscombs outside in a sheltered spot in the morning and bring them indoors at night for one week. Leave them outdoors overnight for the following week, and plant them in your garden in the third week. Plants usually require more water when they go outside. Warm, cloudy, still days are best for planting cockscomb flowers. Plant tall varieties in locations sheltered from strong winds. If the soil in the planting site is dry and thin, dig 3 inches of garden compost or well-rotted manure into the top 6 inches of soil with a garden fork. Gently ease the cockscombs out of their containers by pushing on the bases or tapping the packs on the ground and sliding the plants out. Don't pull cockscombs out by their stems because this can damage them. Plant the cockscombs at the same level in the ground they were growing in their containers, spaced 10 to 12 inches apart or according to the instructions on the label or seed packet. Water the plants thoroughly. Cockscombs look best planted in large groups. With regular watering and feeding, cockscomb flowers are usually trouble free. Spread a 2-inch layer of compost, leaf mold or another fine organic mulch over the cockscomb bed, avoiding plant stems, to help conserve moisture in the soil. Water cockscombs whenever the soil surface is dry, and feed them with a water-soluble 24-8-16 fertilizer diluted at a rate of 1 tablespoon per 1 gallon of water. Apply 1/2 gallon of fertilizer solution to every 5 square feet of garden bed every two weeks, or according to the directions on the product label. Support tall cockscombs with stakes. Push 3-foot bamboo canes into the soil behind the plants, and tie the main stems to the canes with garden twine. You can also use specialized plant supports from your local garden center. Cockscombs rarely suffer from serious pests or diseases. Cockscombs with crowded roots often grow and flower poorly. Check the bases of cockscomb packs before you buy, and don't buy plants that have roots growing through the drainage holes. Also avoid plants that are already flowering because this may be due to crowding or other stresses. Buy plants with healthy, completely green leaves, growing in moist potting soil. Buy plants two or three weeks before the final frost date and no earlier, or the plants will become crowded in their packs before it's safe to plant them outside. If you've already bought plants with crowded roots, cut 1/4 inch vertically into the root ball bases when planting them to encourage the plants to form new roots. Sterilize your pruning shears by wiping the blades with rubbing alcohol before and after using them.